On Sunday Week 4, I attended the last show of Benjamin Guilfoyle A.K.A Woolly Hat Poems’ Lancaster “tour” promoting his first poetry pamphlet ‘Level up’ with illustrations from Lancaster University Art student, Emily Ingle. 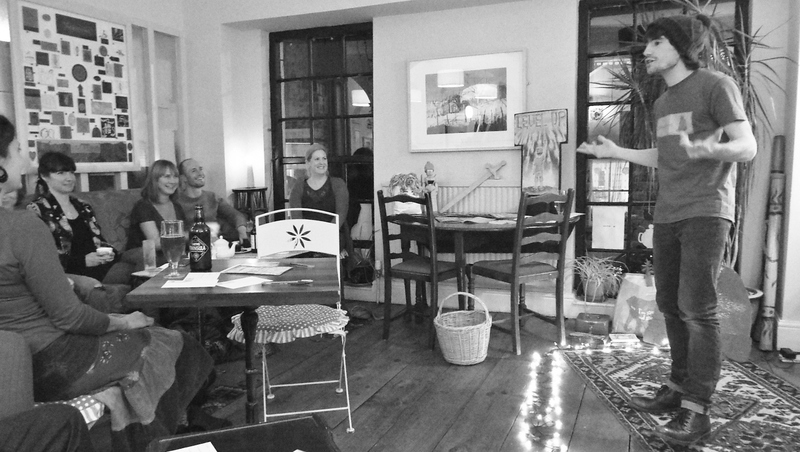 Held in the cosy Meeting Room of The Gregson Centre, it was a quaint evening of wonderfully anecdotal poems and lots of laughs, perfect for a chilly autumn evening. Guilfoyle has incredibly only been writing and performing poetry for just over a year and has orchestrated these events completely by himself. The five shows performed in and around Lancaster were to promote his first ever poetry pamphlet ‘Level up’ which has taken seven months to compile. He has also received great support for his work having been guest poet at Spoken Weird in Halifax and Working Title in Lancaster (which I’d highly recommend). Framed by a string of stars and a carpet of woolly hats, Guilfoyle introduced the event with a sample of his own poetry. Their humorous, witty rhymes and inspirational quality set the tone for the rest of the evening as guest poet Trevor Meaney took over. Despite his set being short and nearly pulling down the stars with his woolly hat, it certainly entertained. Meaney’s use of different voices brought the poems to life, especially in his poem about hair dye which incorporated the slogan, in typical manly-man style: “just for men”. As well as being inventive in poems such as his use of chocolate brands in a love forum type style, which had the audience in stitches as he developed a husky voice and “charming” demeanour. However, his poems also covered more serious issues such as OCD, which at first seemed to dampen the mood until his rhetoric again incorporated humour in order to convey the struggles of OCD and, in doing so, raise an important issue regarding mental health whilst keeping it light and entertaining. After a loud applause for Meaney, Guilfoyle retuned to the stage and explained that he works as the Early Years teacher at the University of Cumbria’s preschool centre, which has largely influenced his writing. This can be seen in sentimental poems like ‘The Floor is Lava’ which reminds us all of that childhood game, and a personal favourite of mine ‘Collin,’ a charming poem showing the innocence of young children and the reality of having to work with them. Other poems such as ‘The Man in the Moon’ hark back to that childish imagination and maybe a wish to return to a more simplistic time which, coupled with more melancholy poems such as ‘Driftwood,’ make you question life and whether you’re really living it. After this first set of poems, it was time for a short break in which Guilfoyle asked the audience to fill out a postcard that asked questions such as “To escape I…”. He later revealed that he intended to pool together these answers into a few poems which he would post online. The event also included a short open mic in which Mick performed some emotive poems about working-men’s pride and the beauty of nature. Then, Peter followed with another touching poem about his visit to Flanders Fields, which was fitting with the anecdotal theme of the night. Guilfoyle then returned to the stage for the last time and asked everyone who had brought woolly hats to put them on before launching into ‘A Woolly Hat,’ a funny fast-paced poem from which he gets his name – as well as his signature woolly hat. The following poems continue the anecdotal, personal quality of his poetry with works inspired by his friends, family and his own experiences. In ‘Your Own Worst Enemy,’ for which he won 3rd place at a Poetry Slam, he described his fear of going to talk to the girl he likes, something that probably relates to most people. His love of gaming is also evoked in poems like ‘Gameboy,’ ‘Algorithm of Change’ and ‘Level up’. These poems both evoke sentimentality and humour yet, especially in ‘Level up,’ a theme that life goes on, as we gain experience and grow, we “level up” and improve. It sends a message that we should never give up which I think was definitely felt throughout Guilfoyle’s poetry. This rounded off what was a lovely evening of inspiring poetry and well-executed performance. Guilfoyle is currently working with the homeless shelters in Lancaster and Morecambe, aiming to compile a pamphlet of their poems which they can then sell and raise money with. He will be putting on a performance of this pamphlet at the end of November. The next step for Woolly Hat Poems is to enter schools giving play and nature-based sessions in 2016. It’s a hat that is woolly. they’ll be a bobble on top. wrapped up in a rug. this you don’t want to miss. and keeps your cheeks rosy. and the trees get thin. stays with you till next March. it goes great with a scarf.